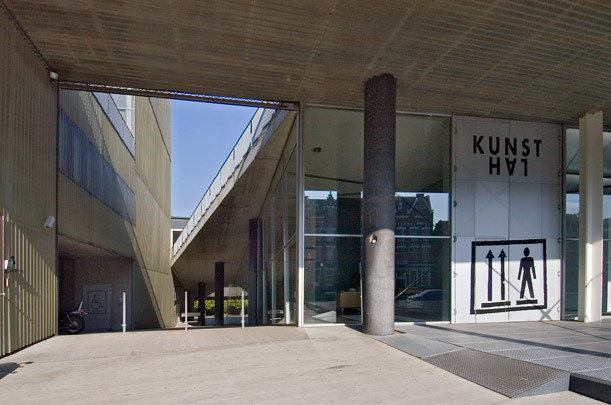 The Kunsthal is intended as a showcase for temporary exhibitions which cannot be accommodated at existing venues. Abutting on the dyke embankment of Westzeedijk, it is transected by a pedestrian route from Museum Park to Westzeedijk and a service road at the foot of the dyke. The building itself is in fact one huge traffic zone, a spiralling system of ramps around the pedestrian route which is itself a ramp. This route slices the building into two portions: a broad wing on the east side containing two large exhibition rooms and a narrower zone on the west housing the auditorium, once again a single large ramp, with a café-restaurant below and a third, smaller exhibition room above. The two large galleries differ in character. The one on the ground plane is a continuation of the park, with black painted ceiling and walls, irregular lighting patterns and four steel columns dressed as tree trunks. The other is a large column-free space two floors up with a transparent roof and a big display window looking out on the busy road atop the dyke. Alongside the two main galleries is a narrow row of exhibition spaces with an upper-storey floor of steel gratings. The third gallery is a smaller, contained space where sloping concrete columns placed at 90 degrees to the raked floor of the auditorium have an unsettling effect. A small balcony provides a view through into the large column-free gallery. Travertine and tarred concrete alternate with large expanses of glass in the facades, each of which is a self-sufficient unit. The one looking onto Westzeedijk acts as a display window, with a services tower on the roof functioning as a billboard to advertise the exhibitions inside. In the Kunsthal materials and constructional elements have been spliced together with no attempt at reconciliation. Contrasting materials, cheap and expensive, elegant and banal, are brazenly juxtaposed.